When the maternal grandmother of Arnon Goldfinger dies, the documentary filmmaker is confronted with the lifetime of furniture, gloves and books she left behind in the Tel Aviv apartment she shared with his grandfather. 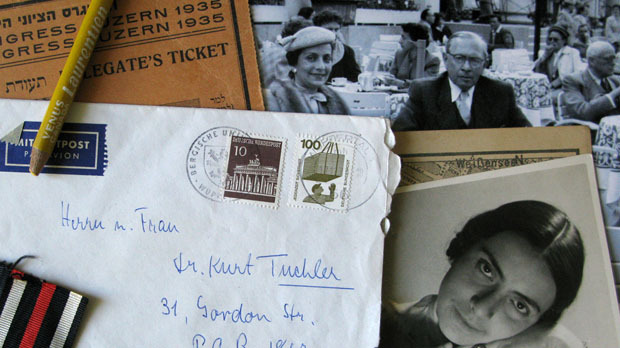 After he begins to document the long process of cleaning out and distributing the items among family members, an unexpected possession rises to the top: a newspaper article which hints at family ties to the Nazis. The Flat (which opens on Friday through Sundance Selects) follows Goldfinger’s initial question of how the article came to be in the apartment, and how it connects to his grandparents and one German family, the Von Mildensteins. But as Goldfinger reaches across generations for answers, he slowly realizes that the people he meets, his family, and even himself, might not be prepared to know what he uncovers. Filmmaker: The film begins after your grandmother’s death when your family begins to clean out her flat in Tel Aviv. When did the process of making The Flat, as it exists today, begin? Were you initially just interested in documenting the process of cleaning house, or did you begin filming after you discovered the “A Nazi Travels to Palestine” articles? I started filming just by myself. One day, while leaving my grandmother’s flat by chance I met the cinematographer Talya (Tulik) Galon, on the street. She lives not far from there. I told her about what I was doing and she decided to jump in. So we doubled the team (later on Philippe Bellaiche shot the film alongside her). We filmed for around two months only what was going on in the flat. And one day Tulik said to me: “Listen, there are terribly funny situations going on but nothing that could keep a film going – this is a film about nothing. It’s Seinfeld, what’s happening here.” I knew she was right but I told her that we must pretend we are fishermen standing with fishing [rods]…waiting for something to happen. However I didn’t have a clue [about] what an emotional journey we were headed to. And to be honest, also after this Nazi newspaper popped up – it took me a while to understand that this is the turning point I was waiting for. Filmmaker: Your film won Best Editing for a Documentary Feature at Tribeca 2012. Its simplicity allows the audience to feel like we’re along for the ride as you travel and inspect artifacts from your grandparents’ flat. How did you approach the editing process? Goldfinger: …The award in Tribeca was one of the most significant, because I see it as an award for the cinematic way the film was made, and of course as a gratitude to Tali Halter Shenkar, the editor whom I deeply [appreciate] and am thankful to. We started the editing process after four years of shooting and thinking about the project. So the narrative of the film was already clear to me. I would say that most of our efforts during the editing process were to try and find the “language” of the film and to shape the film in the right tone. It was a search of [“how am I going to tell the story?”] We decided we should tell it as close as possible to the way I experienced things, from my “point of view.” However very soon the need to “build my own character” emerged. The main tool was my narration. Almost from the beginning of the editing I wrote and rewrote the narration. Then I recorded and used the voice-over in the time line. Needless to say that each of those narration pieces was changed dozens of times ‘til it got its final version. Director Arnon Goldfinger with Edda Von Mildenstein in a scene from The Flat. Filmmaker: As a character in the film you have trademarks, like bringing flowers to the family friends you visit, that tie back to your relationship with your grandmother. How did you come to participating onscreen as opposed to off-screen? Did it come naturally, or did your onscreen role evolve as the film progressed? Goldfinger: This was not a simple choice. The way in which the film developed led me to understand that I had to leave my position behind the lens and become an on-screen subject. At the beginning I was behind the camera myself in the position I was used to. If you notice in the first five minutes of the film (that represents a few weeks) you can see me only from the back and only for a few seconds. The reason is very simple – I was not filmed. We had to struggle in the editing room to find some seconds were the camera was rolling and captured me. As the process of the emptying out the flat continued, and I realized that I am the only one who is interested in the findings, I understood that in order [to] capture this development I must leave my place and go in front of the camera. The hardest thing was to try and forget the presence of the camera. The way to do so was to try as much as possible and concentrate on those who were with me in each of the scenes. It was not easy to lose my “director’s instincts.” I must say that in many aspects this film forced me do things I have never done before. Filmmaker: I love the moment where you briefly mention a family member who was just “too busy” to sit down and talk about family history for the film. What were the challenges that came with integrating your family, including your mother, and strangers like Edda Von Mildenstein and her husband, into the onscreen story? The big dilemmas especially in regard to Edda, Harald and my mother, were moral ones. What should I tell them, and how? What might be the consequences of my telling? Do I have the right to do so? This produced many conflicts in me and lots of sleepless nights. There was also a question in regard to my grandparents that accompanied me during the whole procedure – am I allowed to tell their story without asking for their permission and without giving them the possibility to explain their actions? Those were hard dilemmas. Filmmaker: The film seems to seek a balance between searching for answers and embracing mystery, especially with the final scene where you and your mother search for a relative’s grave on a rainy day. How did you choose to end the film on this note? Goldfinger: From one perspective you may see film editing as a game, almost like [Legos]. After you have the scenes edited, you start moving them around the time line and look for their right place. This game continues until you finally feel that each scene is in its right position. That is what happened with the cemetery scene as well. It moved on the timeline till it got its final place. The first reason for this place is the conflict between me and my mother. In this scene it appears in its extreme shape as it is being expressed in the dialogue between us. This should come at the end of the film. Another reason is that it follows a scene with Edda, and it was important to end the film with my mother, my family (and not the Von Mildensteins) – who are actually my main subject. And one more reason is a bit metaphoric – the film begins with what I call “a celebration of findings” – we find hundreds of books, tons of gloves, amazing number of photos, etc. But as long as the film develops it became much harder to find what I want to find, what I want to resolve. I need to struggle for pieces of papers and pieces of information. Then at the last scene we do not find at all what we are looking for, and we understand we have no chance to find it. This structure refers to my feeling that at the end you can’t really grasp the past, it’s too evasive. You can only start raising questions. You must seek for the truth even if you can never get hold on it, and you must do it even if this truth can be very inconvenient for you.